Sunday 6th April 2014 was a history creating day and in Colombo it was undoubtedly a night to remember. The roar of the lion reigned supreme when Sri Lanka celebrated another cricket milestone winning the T20 World Cup beating favorite India in Dhaka. The party atmosphere throughout the streets of Colombo was astounding with the Lion flag waving and Sri Lankans overjoyed at what their team had achieved. Lasith Malinga, captaining the winning Sri Lankan team joins Arjuna Ranatunga as a world-champion captain. After 1996 the victory in 2014 was a joy that people of all creeds celebrated together in a land that united in common joy. Photo: Sri Lankan cricketers are seen celebrating after winning the World Cup in T20 cricket. Sri Lanka won a record second cricket World Cup cricket title beating India by six wickets in the World T20 final played in Dhaka, in Bangladesh in April 2014. T20 world championship team’s victory procession. In a short span of time, Sri Lanka has awed the cricket world. Sensations in the form of Sanath Jayasuriya, Muttiah Muralitharan, Kumar Sangakkara, Mahela Jayawardena and Arvinda De Silva are names known globally. In a sport still continuing to be dictated according to Western whims and fancies, the accolades pouring for Sri Lanka needs special mention. Living in a politically hegemonic world carrying the ‘white man’s burden’, Sri Lankan cricketers have shown the cricket loving public and the game itself that Sri Lanka is a nation that can produce champions of all calibers. Within the country cricket has contributed substantially to inspiring national pride in Sri Lanka. Opportunities particularly in the Northern and Eastern Provinces of the country for young cricket players and cricket lovers to savor their sport are now on the rise with the defeat of terrorism in 2009. For over two decades the Liberation Tigers of Tamil Eelam (LTTE) had a tight grip on people in areas under its control and prevented them from cheering on the national team. Talented cricketers as well as other athletes were barred by the LTTE from indulging in cricket or any other sport and realising their dreams. It was a proud moment therefore for many to see youths in former LTTE controlled areas waving the Sri Lankan flag as they cheered on the country’s team.It is a clear sign that they have rejected communalism still pursued by a few opportunistic politicians hoping to divide communities and nations in their hunger for power. It will be a great day for all of Sri Lanka and the country’s well wishers overseas to see these youths from Jaffna play in Sri Lanka’s national cricket team one day. It will strengthen unity and contribute to greater harmony between people drawn from various different backgrounds in the country. Let us now walk down memory lane and run through some of our high cricketing achievements. Sri Lanka achieved Test Cricket status in 1981. 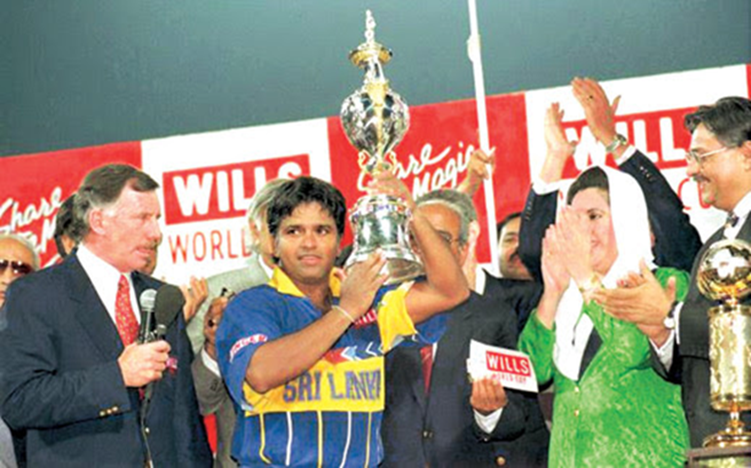 Sri Lanka went on to win the World Cup in one day international cricket in 1996 under the stewardship of Arjuna Ranatunga. Sri Lanka reached the finals of the 2007 and 2011 Cricket World Cup tournaments though could not secure victory. The batting and bowling talents of our gifted players continue to amaze the cricket loving world. The achievements of Sri Lanka is not subject to the cricket field alone. The self restraining character of players was seen in the manner Dinesh Chandimal chose to omit himself from playing in the Indian IPL as a show of solidarity with the rest of Sri Lanka when India voted against Sri Lanka at the UNHRC backing the US sponsored Resolution. Chandimal deserves to be mentioned again a second time in opting not to continue with his captaincy but offering it to one whom he claimed was more deserving and then denying himself to play in the final of the T20 Tournament on ground of out of form. In addition, Sri Lanka can also claim credit for evolving innovations associated with cricket though some of these ingenious contributions have yet to receive due acknowledgement from officialdom in both Sri Lanka and the rest of the cricket world. It is time we consolidate and champion the marvels that our star cricketers and cricket thinkers have introduced over the years both within and beyond the boundary line. We start off with the Umpire Decision Review System (UDRS) also called the DRS for which the composer Senaka Weeraratna is still to be internationally and locally acknowledged for authorship while his brain child the unique ‘ Player Referral’ concept, which was conceived and advocated by him through a series of letters and articles published the world over since 1997 is being widely used not only in cricket but in other sports as well. Introduced into Test Cricket in 2009, UDRS has brought about a rich dividend in increasing the percentage of accurate decision making by Umpires from 91% to 97% and also resulted in less rancor between the opposing teams due to mistakes of on ” field umpires. It is now well over 17 years since lawyer Senaka Weeraratna put forward his revolutionary idea that changed the face of international cricket adjudication and made claim to its authorship. Senaka Weeraratna has put his case before both the ICC and Sri Lanka’s authorities and unfortunately the local cricket administrators have not realized that alongside the credit that will naturally come to Senaka Weeraratna the prestige for authoring UDRS will belong to Sri Lanka thus securing a huge pride for the nation. Sanath Jayasuriya and Romesh Kaluwitharana became the most breathtaking and innovative pair of opening batsmen to walk across to the crease. They changed the one day format upside down and all teams followed that fashion after the 1996 World Cup title became Sri Lanka’s. They became the 1st pair to accelerate the run rate within the first 15 overs and ODI scoring rate saw a paradigm change thereafter. The strategy adopted was to make maximum use of the fielding restrictions placed in the first fifteen overs of the game through an aggressive batting approach by hitting the opening bowlers to all parts of the cricket ground, particularly by lofting their deliveries over the mandatory infielders, rather than follow the standard established pattern of gradually building up momentum and reserve the onslaught on the bowling to the last ten overs in a 50 over ODI match. Both Sanath Jayasuriya and Romesh Kaluwitharana revolutionized the one day game by adopting tactics that the opposing teams were least prepared for and thereby blazed a trail in one day cricket. Muttiah Muralitharan is the first wrist-spinning off-spinner in the history of the game but his inimitable doosra earned him fame for the manner in which he could deliver a surprise to the batsman from leg to off with no easily discernible change of action. Muralitharan was rated the greatest Test match bowler ever by Wisden Cricketers Almanack in 2002. He retired from Test cricket in 2010, registering his 800th and final wicket on 22 July 2010 from his final ball in his last Test match. It was a fairy tale ending to a Test cricket career of an unique and exceptional cricketer that has won the hearts of not only the people of Sri Lanka but the cricket lovers of the world. The Dilscoop is a batting stroke innovated by opening batsman Tillakaratne Dilshan and first displayed during the ICC World Twenty20 held during June 2009 in England. The basis of the stroke is to go on one knee to a good length or slightly short of length delivery off a fast or medium paced bowler and ‘scoop’ the ball over the head of the wicket keeper and in the direction of either the boundary behind the wicket keeper or fine-leg assuring runs to tick on the score board. There has been some controversy on whether the Dilscoop is identical to the Marillier or Paddle scoop. However according to former Australian captain Ian Chappell who was a commentator in the aforesaid ICC World Twenty 20, he had never seen any batsman play the ball straight over the wicket keeper’s head as Dilshan clearly does, thus its originality. Mahendra Mapagunaratne ” a Sri Lanka born lawyer and cricket connoisseur resident in Toronto, Canada is reputed to have given the name ‘Dilscoop’ as well as coined the term ‘Carrom Ball’. It was Ajantha Mendis who reintroduced the Carrom Ball technique to mainstream cricket in the late 2000s which had been originally used by Australians Jack Iverson and John Gleeson in the 1940s and 1960s but never called ‘carrom ball’. The ball is held between the thumb, index finger and the middle finger and released with a strong flick of the fingers similar to how a player flicks the carrom – thus the name. Its unconventional release mesmerizes batsmen making it impossible for them to handle such confusing spin bowling. It is without a doubt that a host of Sri Lankans have given the contemporary cricket world some magic to remember. The innovations introduced by Sri Lanka over the years to cricket entering the hall of fame undeniably leaves Sri Lanka a proud nation. We have shown that even a small nation can make ripples large enough to awe the cricketing world at international levels. Extrapolating, it is an achievement not only for Sri Lanka but for the whole of Asia which is destined to lead the unfolding 21st Century. Parodying the title of a well – known carol, a favourite in both USA and Europe, we might as well say as proud Asians that Sri Lankans have brought joy to the cricket world. 1. Forget your “glory” and “seniority” in the team and work together to achieve the goals even under the most “junior” leadership of capable persons. 2. Give up your “leadership” when you feel that there is some one more capable and suitable at any given point of time and “sacrifice” for the sake of achieving a common goal. That is a “SUPREME SACRIFICE” and that is termed as “SACCA-GNANA”- KNOWLEDGE OF THE TRUTH IN BUDDHISM. Now getting back to the “Winning of T20” and turning to present day events. The latest development in the SLCB circle is to go all out to clip the wings of two senior most players in the team on some incident -( a press statement made) at the time of arrival in Sri Lanka. If this news item is correct, isn’t it a display of our “BOORISHNESS” much prevalent among higher echelons of management of affairs of the country? Do these people sitting in “High Positions” have an iota of respect and honor for our “HEROES” who brought such glory to the country and the nation, other than to preserve their own “GLORY” on whom such “GLORY” has been thrust upon them as result of being able to “Boot Lick” the Big Wigs.? In these difficult situations that would develop in the coming days and months, I urge all our HEROES – the members of the Team, to unite and stand together to fight against these “CORRUPTED GOONS”. So please the GAME well. This entry was posted on Tuesday, April 22nd, 2014. You can follow any responses to this entry through the RSS 2.0 feed. You can skip to the end and leave a response.